Blog Home > Docks & Shipping > What’s the Most Useless Space in your Warehouse? What’s the Most Useless Space in your Warehouse? Next time you’re standing there wondering where you’re going to put an inbound shipment while your dock is stacked with empty pallets, look at those doors (or at the void above them) — the copious space between the top of the doors and the ceiling is unused. Multiply each door by that amount of space, and in many operations, we’re talking serious amounts of unused square footage. The easy solution: find a use for it with over-dock-door storage. You can’t really rack heavy stuff up there without some significant structure. The best thing to consider is empty pallets, which take up a ton of room and are relatively lightweight. And usually, they’re all over the floor and always in your way. Empty pallets clutter up the shipping & receiving docks or can take up positions in your racks that would be better suited to full pallets of finished goods or incoming shipments. Empty pallets can be a safety hazard, particularly when stacked on the floor, because they’re easy to tip. Their quality and construction varies widely, so stacks of them can be unstable. They also create visual impediments when stacked too high, meaning lift truck drivers have to look around them or deal with them instead of clean, empty spaces. With over the door storage, you can seize that useless space and stow your pallets there, instantly freeing floor and rack space up for safer, more organized, more useful purposes. It also keeps empty pallets better organized, and out of your hair until you need them. Since you aren’t dealing with stacks in a corner, accessing those pallets is easier, too. Over-door racks can also accommodate skids or returnable shipping containers. The empty pallets are kept above the dock door, ready to rack incoming materials or ship outgoing goods. The standard installation we’ve seen has 2 shelves above an average 12′ wide dock door. That adds up to around 100 square feet of accessible space per door. It makes sense, because that more valuable floor and rack space can be used for more useful tasks and more valuable inventory. Conventional rack uprights: For the greatest capacity over each dock without attaching to the building or roof, heavy-duty conventional uprights can be used. Typically, these are designed to be freestanding with two support legs on a cement floor. This configuration is advantageous when no load should be added to the building wall or ceiling. Single-leg uprights: A single-leg design allows more clearance for forklift traffic, while adding no load to the building’s roof structure. This configuration uses an upright frame with a special offset and a single upright column that clears the dock door height. Heavy-duty wall ties stabilize the frame, and wall tie and beam length are varied to clear the dock door. Wall ties need to be secured to a solid, concrete type wall. A sheet metal walled building would not work for this type of installation. Ceiling support: For maximum clearance of forklift traffic, a ceiling supported design is suitable for buildings of any wall type. “In this configuration, no lower legs interfere with forklift traffic, and rack frames are bolted or welded to the roof trusses of the building,” explains John Ellis, a Steel King regional sales manager. 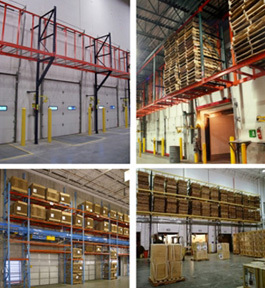 This configuration, however, must be designed in conjunction with the building architect, who must verify the building’s ability to support the additional weight of the racking and pallets. For sufficient strength with economy, the Over-Dock Pallet Storage Rack can be built with SK2000 boltless tubular uprights. For added strength, it can be built out of structural tube or SK3000 structural channel uprights. For beams, Over-Dock Storage Racks generally use channel load beams with bolted connections. To prevent pallets from falling between beams, two bolt-in pallet supports are installed under each pallet position. For extra security, you can opt to add pallet rack safety netting or bolt-in steel restraining straps be used at the back of each rack bay to secure pallets. For post protection, especially of single leg racks, guard rail systems are highly encouraged. You can also store other lightweight stuff in that space, but you’ll definitely need to check capacities, usage rates, and other factors.